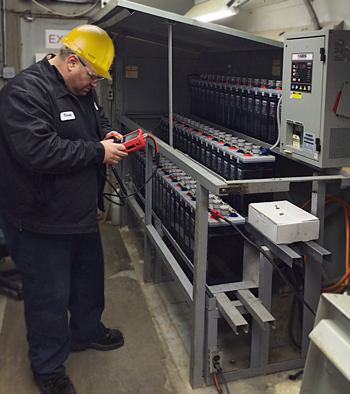 Whether you contact Storage Battery Systems to perform your battery installation, for routine service work, to purchase test equipment, or if you simply want advice, we are here to help. SBS has been in business since 1915 so we have the experience to answer all of your questions. SBS has a nationwide service network that covers the U.S. and beyond. SBS can help you meet all the requirements of testing and maintaining batteries per NERC standard PRC-005-02 and IEEE standards. SBS can decommission and recycle your old battery system and then install, properly set up and test your new system. We have been installing stationary batteries for over 30 years and have the experience and capabilities to do this type of work at a competitive price anywhere in the world. The ultimate warranty protection will be available to you if you purchase an SBS battery system and have SBS install it as well. to schedule service or preventative maintenance, nationwide. 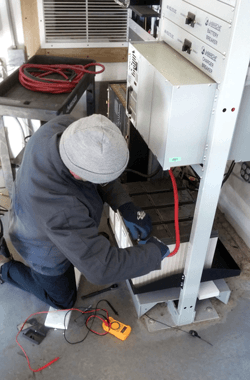 Not only do we install our stationary batteries and chargers but we can also be contracted to do routine maintenance, such as quarterly or annual PMs. Both IEEE standards and NERC standard PRC-005-02 reference battery testing/maintenance guidelines. 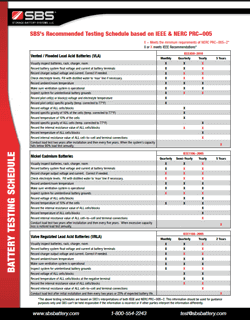 Battery manufacturers also publish testing requirements to ensure warranty compliance. SBS will test and provide detailed reports that will comply with all requirements, such as recording internal resistance, battery terminal connection resistance, specific gravity, and more. For more information, see our page on IEEE and NERC battery standards. Load tests are the most accurate way to determine the state of health of your battery. Load tests are also very time consuming – they typically require that the system be shut down and taken offline and also require special equipment. SBS can perform IEEE load tests based around your requirements. As an option we can provide temporary power so that your system does not have to be shut down. After the load test is completed we provide complete reports that will comply with NERC standard PRC-005-02. Companies often subcontract battery testing because of a lack of manpower, or because people believe that this work is difficult. If you have the manpower to do your own testing you can save a very significant amount of money each year by purchasing your own battery testing equipment! SBS has been selling battery test equipment for nearly 30 years. We were the first company to introduce a digital hydrometer to the North American market and today we continue to develop innovative, unique products that allow any technician to do their own testing and reporting. Experience in this market is what sets us apart from our competition. We have technicians on staff with decades of experience both in the office and in the field. They are able to repair and calibrate battery test equipment and are also available to provide training and support whenever it is needed. Our test equipment allows users to maintain reliable battery systems and to ensure compliance with applicable industry regulations. SBS offers training on topics related to DC power. We offer customized battery training courses which are designed around whatever topics you would like your employees to learn. Contact us today for all your stationary battery service and testing needs.